In 1825, John Tibbits and his family moved from Massachusetts to this area of Michigan. His father was a farmer in that Atlantic Coast state. 1825 was the year the Erie Canal was completed making the trip to Michigan very much easier, although it was still a long and slow journey. Presumably, he wished to establish a prosperous farm on fertile land available at very little cost. By the 1820s, Indians left this area and there was a small population of settlers. Late in that decade, the residents sought to form a chartered township. On February 26, 1827, elders of the settlement met at the home of John Tibbits to select a name for their location. LeRoy was their first choice but they realized that the name had been used at least once in Michigan. The territorial legislature, at this time, was quite insistent that each location have a unique name. The second choice for a name for the township was Plymouth to honor the Massachusetts location where the Pilgrims disembarked more than two hundred years previously. Territorial Governor Lewis Cass and the legislature granted a charter to Plymouth Township on April 12, 1827. 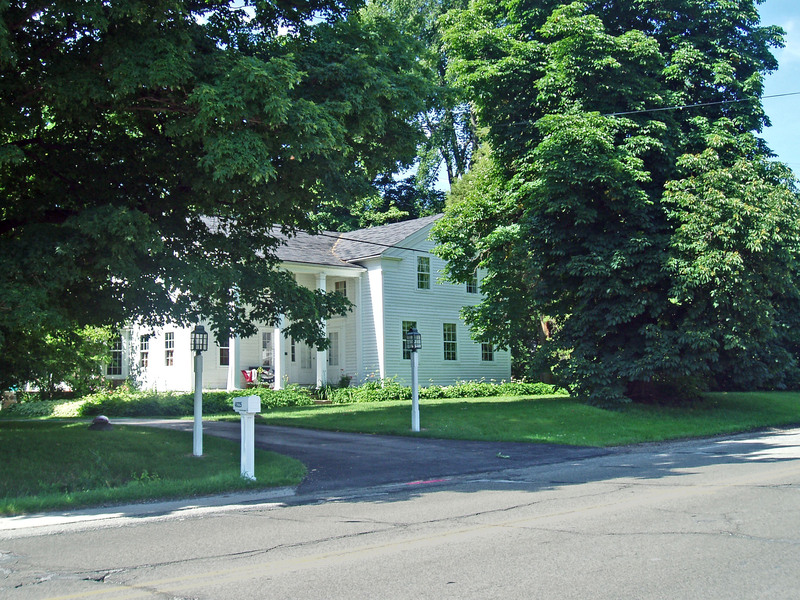 The next month, May 25, 1827, the first meeting of township official was held in John Tibbits barn. James Witherell, who had been a territorial judge since 1808 and who is commemorated by a street that borders the new Comerica Park in downtown Detroit, came out from that city to give the oaths of offices to the township officials. John Tibitts served as a township supervisor, but I do not know if he was one of the original officials. At a later point, he became the auditor for Wayne County. In 1860, he successfully ran for the Michigan state legislature and served one term in Lansing as a solon. The architectural evidence suggests that he was a highly successful farmer with good taste. I do not know when the home you see was built, but it dates from before the Civil War. 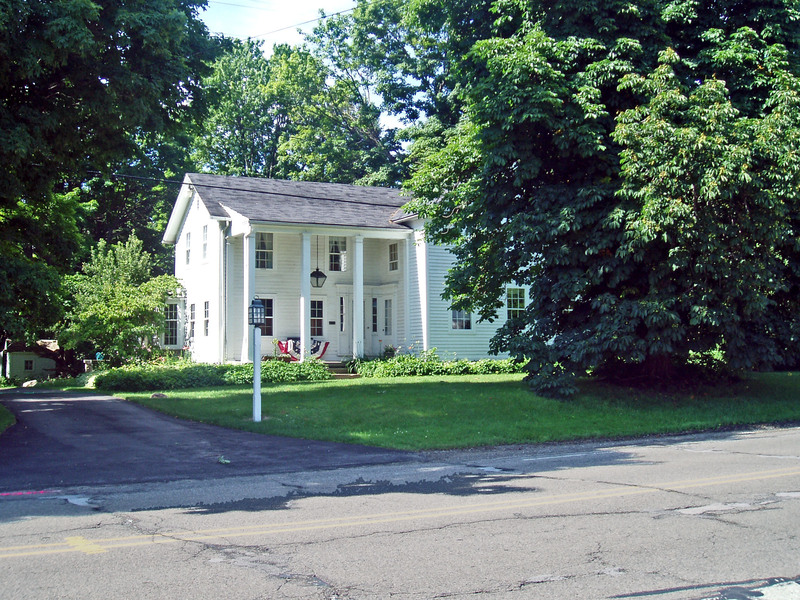 It was originally a Greek revival structure. In 1939, the residence was renovated, most prominently by the addition of the Colonial Revival entrance that you see at the front of the home. I believe that this farmstead includes a clapboard milk house that Tibbits built. There is also clapboard barn designed in the bard and batten clad style and a Greek revival carriage house. There is a disagreement about whether the surname should be spelled Tibbitts or Tibbits. The documents in the State of Michigan Registry of Historic Sites use two t’s at the end of his name. The Plymouth Historical Society documents show his name with one final t.